Last year Academy Games added another title to their long running and highly successful Conflict of Heroes series, this time bringing American forces into the mix. Conflict of Heroes – Guadalcanal is a squad-level tactical wargame covering a three month period through Operation Watchtower, the battle of Guadalcanal. 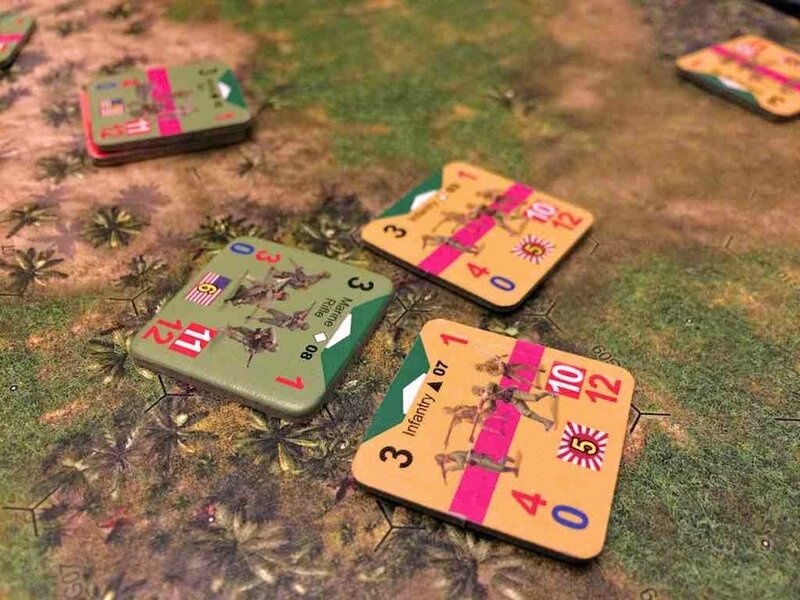 Using the proven Conflict of Heroes – Awakening the Bear system, Guadalcanal stays familiar while introducing a new theater, jungle and beach terrain and an interesting twist on the command action point scheme. In my review of Conflict of Heroes – Awakening the Bear earlier this year, I shared my opinion of the CoH system overall and in depth. Since these games are so closely tied in mechanics, I’m not going to rehash those same points. Instead, we’ll be looking at the changes and additions that Guadalcanal brings to the table and their impacts on play. If you’d like to read more about the CoH system, you can read my initial review of AtB here. Just as with AtB, Guadalcanal is a great introduction for those looking to dip their toe into the WWII tactical genre. It follows the same stepped approach in learning the game, walking you through the first several battles in the firefight book. As we’ve come to expect, the counters and assorted components are all top notch, and the mounted map boards are stunning to look at. Academy Games does an amazing job at bringing us gorgeous and functional maps, with a mixture of terrain that is easy to read. Light jungle shows a slightly frosty glow at the top of the palm fronds, while heavy jungle is dark and ominous. To add a wider array of terrain, overlays are also provided to help change up the four mounted map boards. Japanese troops fearlessly close with a Marine rifle team. Just as with AtB, Guadalcanal comes with a wonderful insert to house all of the counters. There’s a lot of room to separate everything out for ease of retrieval as you see fit. Be mindful of the top however, mine walked off into the ether when my wife went on a cleaning binge. Otherwise, you’ll end up having to transport the box gingerly lest I spill Japanese and Marine forces wider than airborne sticks at Normandy. I need to remedy that and fashion some sort of topper to keep my troops in line at some point. 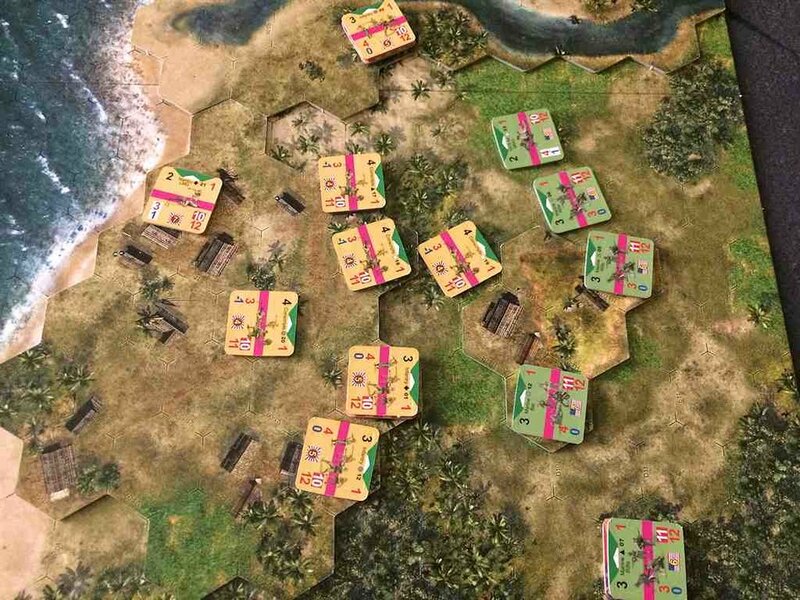 Conflict of Heroes – Guadalcanal continues with the existing system, allowing return players to jump right in while nurturing new players through the process by divvying out the rules in small bites through the first half of the firefights. Academy Games puts a lot of effort into making their manuals very gamer friendly, and the CoH series is quite likely the easiest of the genre to learn in that regard. The firefight book opens with a three page synopsis of the overall campaign, including the major players. Twelve commanders from both sides are profiled, matching the number of firefights included in the game. Adding to the concise read of the conflict is a timeline of August through October of 1942, listing the progression of the campaign. Interspersed throughout are the firefights from the book and where they fit in by date, culminating with the Battle of Henderson Field. As expected, things start out small and easily managed in the first couple of firefights but quickly escalate. Jungle terrain is prohibitive for both movement and combat and Academy does a fantastic job of conveying this without making it feel like a chore. You understand the difficulty of slogging through dense jungle while also fighting across elevation changes, making maneuvering for advantageous positions paramount to gaining LOS. Japanese units are comprised of infantry, machine gun teams, conscripts, mortars, grenade teams, gun teams and armor. US forces match these with Marine rifle and BAR teams, MGs, mortars, anti-tank guns, armor, air and naval gunfire support. While armor does show its face, it’s only there long enough for a cup of coffee in a minor support role. The meat and potatoes of this game is infantry combat, and it’s fast and brutal. Actions are carried out in alternating impulses, using a mixture of Action Points and Command Action Points just as in AtB. Each unit has 7 APs to use on their activation and CAPs are assigned to both players via the firefight setup, with the Japanese player nearly always starting with fewer than the US. Only in two of the firefights do the Japanese begin with more than the US, and in one scenario they start with zero! The reason for this is a major change, the addition of a new mechanism called Bushido Points. Bushido Points are a simple yet adroit way of modeling the Japanese code of Bushido, as it was reinterpreted by the Empire of Japan during this period in history. In order to marshal an unqualified obedience and dedication to the emperor, from both the troops and populace, the Japanese military infused a twisted take on the ancient Bushido (way of the warrior) code into the culture. In order to push your troops farther you’ll need CAPs, and Bushido Points gain you more of these when you fulfill certain BP goals as spelled out in each firefight’s setup. This is an interesting design choice, imposing upon the Japanese player the necessity to employ non-traditional, and oftentimes ill-fated tactics in order to wield more command influence. Many of these goals revolve around control of objectives, engaging in close combat or quick movement off the edge of the map directly through the Marine lines. This means aggressive advances into enemy infested areas, keeping in line with the ferocity that Japanese troops showed in the battle. For each BP gained, you add CAP to your total, and likewise, you lose BP and CAPs when you fail to meet BP goals. As I’d talked about in my previous review of AtB, I really like how the CAPs model a leader’s ability to maintain control and dictate extra actions for their troops. Even when a unit is spent, CAPs allow you to push troops that extra mile to continue the fight, if you have them to spend. To emphasize the importance of aggressive action by the Japanese player to gain BP, unlike the US player, they do not suffer CAP losses when units are destroyed. Troops aren’t as valuable a commodity to keep alive in that regard but are resources to expend in order to gain more latitude. However, do so smartly because winnowing down your troops quickly will easily cost you the battle. Attrit the US player often, and know when to commit yourself wholly to the attack. 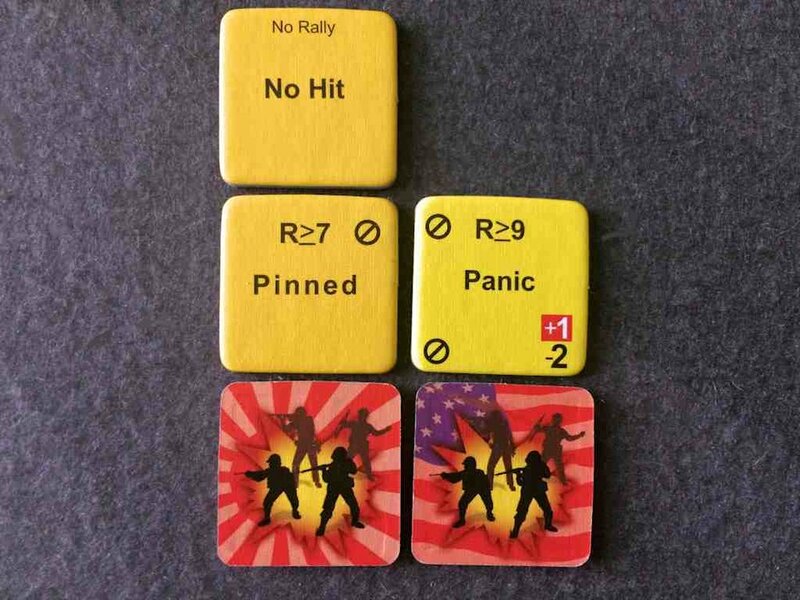 Keeping with the tone of the Japanese military’s fanaticism and fearlessness, a number of special ‘No Hit’ tokens are added to the damage counter mix at the beginning of each scenario. These ‘No Hit’ tokens simulate the Marines difficulty in knowing if they had clearly eliminated Japanese units in the field. As in AtB, a second hit takes out a unit but you’ll need to put that second hit on them to see if either imparted damage. Good use of group movement will help you attain Bushido Point goals, and in turn, more CAPs. Success hinges on this for the Japanese player who will need to be rather aggressive to succeed. The US player must match that aggressiveness but in measured doses, knowing when to commit and when to better use maneuver and exploit support. It’s interesting how one simple mechanic can have deep impacts on game play, and it really does here. That’s the mark of solid design work, well done Academy Games! Hidden movement plays a vital role in several firefights and are even tied to Bushido Points. While these scenarios aren’t as good for solo play, some creative home ruling can work through this somewhat. Hopefully we’ll see the AtB solitaire system ported over to this game in the future to alleviate this shortcoming. It would be easy to throw some jungle maps and proper theater counters into a box and call it done, but that would be half-baked and not how Academy does things. Instead, they kept with their proven system and made the right changes to fit the Pacific theater, making Conflict of Heroes – Guadalcanal another successful title in this excellent series. Bushido Points are an innovative way of simulating the differences in tactics, training and mindset of US and Japanese forces of the time. It’s not simple chrome added as flavor but a competent way of intimating Japanese tactics upon the player, forcing them to think less conventionally. This is a solid system that could be utilized for any conflict, in any theater, with proper tweaks and slight alterations to suit the subject matter. Here’s hoping we see more CoH games, spanning a multitude of conflicts up through modern day. Conflict of Heroes is one of three tactical systems that I really enjoy playing, sidelong with Lock n Load Tactical and Band of Brothers. Each system fills a certain spot in the tiny niche of tactical games, which for us as gamers is fantastic! CoH has the benefit of being the easiest of that bunch, with the best written and most streamlined rule set currently. New players can easily grok and get to playing this game quickly, making it a great first step system for those interested in the genre. If you’re a fan of the CoH system, or have an affinity for the Pacific theater, Conflict of Heroes – Guadalcanal is a must buy. Jump in, the water’s fine, but watch for that incoming off the beach!